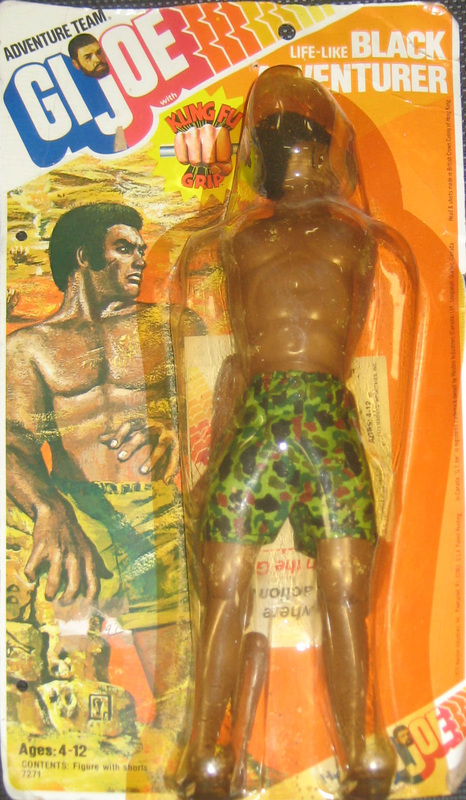 The 1976 Life-Like Adventurer was released in two carded versions, a basic (7271) with just the figure and tan shorts and the complete version (7283) with shorts, tan fatigues, boots and a black hunting rifle with rubber strap. The Adventurer comes with black flocked hair and brown eyes. Below left, an example of the carded figure with uniform, courtesy of the fine folks at L and L Collectables. Be sure to check out their sales of GI Joe and all kind of great toys here. Right, the basic figure released with just shorts, courtesy of Steve Stovall. Find his auctions on eBay here. Note the shorts on the figure to the right. The camouflage versions usually came withe the Land Adventurer, but at the end of the run Hasbro seems to have used whatever was handy. Below, an image of a rare transitional version of the figure that was shipped in a 1974 KFG box with the box emended to reflect the different stock number. This may have been done to use up overstock of boxes. Courtesy of Joezeta.